Ravinthranath is a well-rounded UX Designer & UI Developer. He has Good knowledge of user centric design, wireframe, prototype and also unique ability to build the design concept. He has an extensive experience creating websites from the ground up, Rejuvenating existing sites and making complex tasks and information seem usable, simple, functional and attractive. Ravinthranath has developed branding, corporate identities, public facing websites, SharePoint websites, Intranet sites and advertisements for professional products and services. He has worked on various technologies and is currently specializes in SharePoint User Interface, SharePoint User Experience and Responsive Design. He has good experience of Mobile Application UI Design, UX Design and have an exceptional background providing superior creative design concepts and management in complex hierarchical organizations. 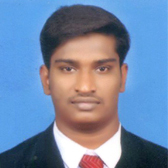 Ravinthranath strengths lie between design and understanding front and back end of web development. He gained solid within IT and in many diverse industries. Specialties in User Centered Analysis and Design approach. Good hands on OOCSS, performance oriented CSS selector, scalable and modular CSS approach for front-end architecture. Experience Parallax Web Design, Fluid Web Design. Excellent skills on getting rid of Cross Browser UI (HTML/CSS) Pitfalls.